These quotes are from unsolicited emails from participating Flea vendors. Some quotes have been edited for brevity. "Sunday was our first time serving at the flea, we had a blast! Thanks!" "Josh and I have sold at a number of different venues since I moved to the US three years ago, from pow wows, farmer's markets and trunk sales up in Vermont. Some are better than others. Our experience at the Flea these last two weeks has been wonderful. You have it very well organized and such a great diversity of vendors that foster a great community. We have met wonderful people, both vendors and clients and had overwhelmingly positive experiences--just talking or the unsolicited assistance in helping to set up or take down canopies... The diversity of products and the general environment that dignifies the work of artisans and vendors creates an alternative space that we really appreciate and feel lucky to be a part of. The team that you have receiving us as we arrive and periodically checking in has also been great. Also, the location is beautiful. I look forward to this next weekend at the flea! "Thank you again for having us at the flea!! We had a ton of fun and met a lot of people! We were wondering if you guys have an open space for the 26th of June? We would love the opportunity to attend again. Thank you!" "Thank you for giving the Food Bank the opportunity to participate in the final Flea! We had a great day promoting Hunger Action Month and taking 'spoon selfies.' I hope we can work together again next season--maybe even with a food drive at the Flea!" "Thanks for today to start with and secondly, I wanted you to know that whatever advertising you have put 'out there' is working. Well, it did for me today! Amongst a few positive flea based chit chats, a couple came straight to my booth and bought my white chair because they had seen it on the Internet. They were happy...and so was I. So...thank you....or as I would say...cheers, love!" Thank you for having us this weekend as your featured non-profit! We made great connections and new friends...Let us know if you're in the Pawtucket area and want a tour! "Just wanted to thank you and your team. As a first timer yesterday, I found it to be wonderfully organized, a great venue, I had terrific neighbors and everyone could not have been friendlier! ....AND....I had a vegan root beer ice cream float - no one was happier than me! :)"
"Thank you, Providence Flea, for the free opportunity to have a booth at Providence Flea for the Westerly Armory. We were most impressed by the professionalism of the event and we had a wonderful day. People were very nice; we sold books and games; we had fun. Thanks again." "Thanks for the great pictures of my booth! Will be back on the 28th and I'm planning on having a TAG Sale." "Thanks for the share and Wow are you folks super organized. The very best 'load-in' experience we have ever had!" "Hi Providence Flea Team. Thank you so much for having us this past Sunday! It was great to connect with the community and share all the great things that our young artists are doing. You all were such a help and made the whole process very easy, even for an inexperienced flea-er like myself. Thanks again!" "Hi! I was wondering if you had any more space left at the Flea on Aug 25th? I would love to add that day if possible, if not I totally understand. Thanks for running such a smooth show. It really makes it a pleasure to vend with you guys." "Good morning. Had a great time yesterday in spite of the heat! Heard through the grapevine you are at capacity for next week. If I heard wrong I would love to participate. Thanks." "Hi, thank you for all the hard work and effort you put into The Flea. We really appreciate it. Peace." "We loved being a part of the Flea last weekend, and are looking forward to many more summer Sundays!" "Thanks to @ProvidenceFlea for making Providence even more better than ever. We had a great time yesterday in #foodtruck and vintage heaven." "Just wanted to thank you again for putting this fabulous event together and for including us. Every week is better than the next! Today was CrAZy busy and we loved every minute of it." "It was great meeting you this weekend at the Flea. I had an awesome time and met some great people. I really liked the set up and there were lots of people :) I plan on coming back on Sunday. Thank you again!" "Thanks so much for allowing Munchies to serve at your market. Please let us know if you have any cancellations we would love to pick up another Sunday." "Adopt a Doctor was honored to be given a booth at the beautiful Providence Flea Market this past Sunday. What a difference your generosity made in saving lives in Africa. With the funds raised, we are able to pay the salary of one of our sponsored African medical practitioners for 5 months. All of the volunteers at Adopt a Doctor thank you for your kindness and vision." "Just wanted to say thanks for today. It was good exposure, good money and fun. I am thankful for the opportunity to supplement sales at my shop." "Best thing to happen in Providence since Waterfire." "I've been meaning to email you for days to let you know how lovely the First Flea was! I was running all around that morning taking care of logistics and loved getting to see the tents go up as I crossed the Point St. bridge, and then being in the heart of the Flea with the cart later on... It was truly amazing to see that piece of land come alive and to see it being used for such a variety of awesome things at once: strolling, shopping, eating, sitting, enjoying the breeze, water & views, children playing, families relaxing, etc. It's some of the nicest, most sittable grass in town and now people know to come out and enjoy it. Really looking forward to Sunday's 2nd Flea! I can imagine it's been a ton of organizational work on your end...but I think it's paying off. The added Sunday vibrancy to the city alone is a huge thing. Your team deserves a lot of credit as well--they were working tirelessly! The t-shirts you were wearing were super cute...Fun cut & retro style! ...It was great to finally meet you and put a face to a name! See you again soon!" 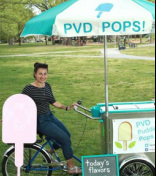 "Just wanted to follow up to say thank you so much for including us in the first week of PVD Flea! Sales were good, and, thanks to the large crowd you pulled, we've already made valuable connections with people we met while vending! I'm sure your booths are rapidly filling up, but would it be possible for us to sign up now for future dates? I'm attaching photos of a couple of summer designs that our kids have been working on-- we'd love to be able to show them at PVD Flea this summer!" "I wanted to thank you so much for all your hard work on the Providence Flea! Sunday was fantastic... I think this IS ALREADY and is going to CONTINUE to be so sucessful. You and your staff were the NICEST people ever. I mean seriously. You gals/guys are awesome. I feel really fortunate to have gotten on board early. I think you are doing something lovely for providence. So thank you. Thank you! Talk soon :)"
"Great job! Just again wanted to say "thank you" for such a successful Opening Day! Really great crowds, people were there to shop, and, you did a great job with the weather! ...Very well worth it for me and I am looking forward to doing it again! I think being somewhat unique in my offerings helped as well. It's always good when you corner a niche! "